Picked all this goodness from the garden yesterday. Patty pan, crookneck and zucchini summer squashes, lemon and pickling cukes, and loads of tomatoes, in assorted and sundry varietals and sizes. About to put in my fall garden, too. Looks like we'll be eating fine for some time to come! *That's echinacea flowering in the background. I plan to dig up the roots this coming autumn and turn them into a tincture for English winter wellness. Want to come to The Creative Connection event in St. Paul this September? Want to come for free? With a friend? And get complimentary accommodations while you're at it? Yes, yes you do! Then pop on over to TCC's blog for the skinny on how you can try your hand at winning. The event promises to be a good one, with an incredible line-up of talent on hand. I'll be there, teaching a class on water bath canning. Good luck on winning! Hope to see some of you there! There's a fantastic article by Julia Moskin in the NY Times on what's being called "stem-to-root" cooking. Much like nose-to-tail meat-eating, wherein all of the parts of an animal are consumed (and not just the meatier pieces in the middle), stem-to-root "honors," if you will, every component of a fruit or vegetable, from its flowers and shoots to its rind and peel. It also respects the labor involved in growing the item, as well as the "life force" present in it (that last part is my own addition; I'm a big believer in the inherent vitality of all living things). It's the sort of cooking that's completely in line with my small measure ethos. Vegetable scraps take up an awful lot of space in landfills (it compromises about 28% of the overall debris-crazytown!). If you're not composting, stem-to-root cooking is a fantastic means of utilizing completely edible, but often overlooked, parts of produce. The article concludes with mention of John Shields, head chef at Townhouse restaurant in Chilhowie, Virginia. Some of you long-time small measure readers might remember the wedding I worked up there several summers ago, when I had the amazing good fortune of meeting John and his then-fiance, now wife, Karen Urie. That auspicious meeting later turned into a profile of the couple in my Keeping Bees book. Although they don't keep bees themselves, John and Karen are strong advocates of the honeybee, hosting benefit dinners and sponsoring hives on culinary farms (as chefs, they are acutely aware of just intimately the plight of the honeybee is tethered to the raw materials they work with on a daily basis). After working the floral design on that wedding, Hubs and I returned the following week for one of Townhouse's honeybee benefit dinners. There are not enough superlatives in existence to covey just how memorable, exquisite, delicious and phenomenal of a meal that experience proved to be. If you're in the area (Chilhowie is in the mountains of southern Virginia, and about two hours from Asheville), you really must go. Hell, even if you're not in the area, it's totally worth the pilgrimage. In the mean time, I've got some carrot greens to add to a salad and some watermelon rind to pickle. *Image from Tony Cenicola/The New York Times. I picked up a bottle of this Lenoir, NC-made apple brandy the other day. It's created using N.C. apples in a 110 year-old carriage house in downtown Lenoir, and aged in white oaks barrels. I haven't cracked it open yet, but I'm pretty excited to do so. Any of you have a preferred means of imbibing apple brandy? On the rocks? Mixed with sparkling cider? Chilled? Meanwhile, after wrapping up this series last week, I've begun reading Kurt Timmermeister's Growing A Farmer: How I Learned To Live Off the Land. The book tells the candid tale of the author's transition from owner of a small 4-top cafe in Seattle to proprietor of a 13-acre dairy farm (Kurtwood Farms) and creamery. I'm totally smitten with the book so far and look forward every night to when the monkey pictured above finally turns in (he's not going down until 10:30-ish lately-sheesh!) to jump back into its inspired pages. Plus, I just checked the 10-day forecast for Vashon Island and, well, it's pretty much my idea of heaven. Maybe someday we'll make the transition to the west coast. The humidity alone around here lately is enough to make me point my compass due west. I've got a great guest post for you today! It's from Aiden FitzGerald, a freelance writer and the voice behind A Little Fire. Aiden, her husband Charlie Barmonde (a ceramicist and an old friend of Hubs' from his days of hijinks and shenanigans in Sarasota, Florida) and their adorable young son Felix live in the tiny coastal Rhode Island town of Little Compton. She recently wrote a guide to the area, an absolutely dreamy region referred to as the "Farm Coast," in Design Sponge. Next time I'm up that way, I'm definitely getting my Farm Coast tour on, no doubt. Aiden recently enjoyed the fruits of her labors, after ravaging her raspberry bushes and rendering the ruby orbs into raspberry jam. I know a number of you are firing up your canners and turning out all manner of jams these days, so her post is especially timely. Here, she shares her experience with us. "Aside from being jabbed in my eye by a branch as I reached for a raspberry, dark and plump and begging to be plucked, my first canning experience was delightful and delicious – and eye opening. 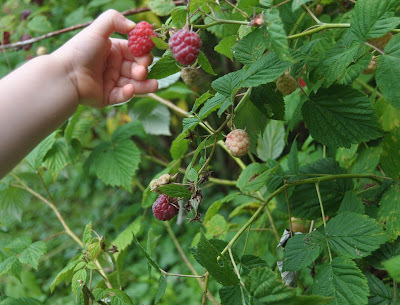 With my fourteen-month-old son slung on my hip, I picked berries from the bushes in our backyard. Just like Sal in McCloskey’s Blueberries for Sal, he grabbed them from the bowl, gobbling them faster than I could pick. Eventually I moved him to my back and fed him at a slower place. With a bowl (and bellies) full of raspberries and our fingers stained fuchsia, we headed inside to have a go at uncovering the mystery of canning jam. While most readers of Ashley’s small measure are probably avid food preservers, canning isn’t part of my culinary background. I had never wielded a jar lifter and hadn’t a clue what a water bath had to do with the process. But the idea of enjoying on a cold winter day something fresh from our summer garden appeals to me, and I’d like my son to grow up with such experiences. So I sanitized jars and scrutinized the recipe, resisting my tendency to stray from its directions. I measured carefully—2 cups of berries, 2 cups of sugar. It took everything in me not to reduce the amount of sugar and add a little zest, maybe some mint, or ginger. As the heavenly scent of sweet boiling berries filled my kitchen, I wondered why I hadn’t done this sooner. Sometimes, I was reminded, we just have to leap. And soon enough we’re rewarded – in this case, by the satisfaction of smearing my own homemade jam (tasty, but too sweet) on toast. Next time I’ll embrace my urge to experiment. (Add some rum? 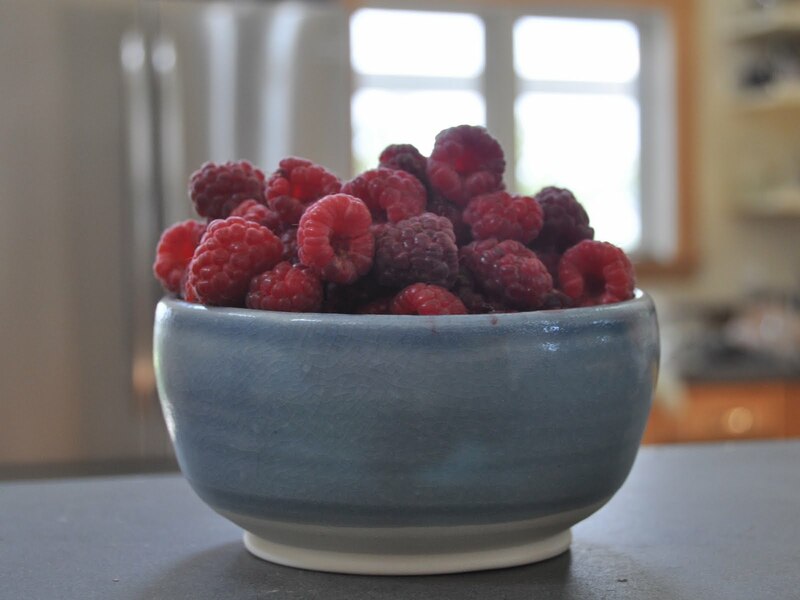 Ashley’s recipe for blueberry raspberry jam with allspice and rum sounds delicious.) First, though, I think I’ll try something savory. Our cucumbers are calling and I’m craving some pickles." Thank you so much, Aiden, for your guest post. That jam looks phenomenal! What about you? Got a hot topic you think will appeal to small measure readers? Shoot me an e-mail at: ashleyadamsenglish(at)gmail(dot)com and let's see what we can work out. One of our favorite "it's-far-too-ungodly-hot-to-even-look-at-the-stove" go-to eats during the dog days of summer is rotisserie chicken salad. After picking up a cooked bird from our nearby natural foods store, we'll strip the meat off and blend it any of different ways. On my birthday, Hubs did it up with a curried spice blend, and then served it on fresh wheat bread slathered in mango chutney. HEAVEN! The other night, we took our chicken to the Mediterranean, partnering it up with olives, cherries, cashews, capers, olive oil, and lemon. For a bit of heat, we added harissa, a chili sauce commonly found in North African cuisine (if you don't have harissa, but still want to feel the burn, just use Tabasco instead). Here's the recipe, should the urge for a nice and easy cook-free meal strike you! *We use a concoction from Urban Accents. It's grand. Lacking that, toss in about 2 teaspoons ground coriander, 1 teaspoon ground cumin, 1 teaspoon cinnamon, and 1 teaspoon mint, dried or fresh. Serve with fresh tomatoes as a sandwich, in a pita, or over lettuce. So, here it is, folks. I decided to enter small measure in Country Living magazine's 1st ever Blue Ribbon Blogger Awards. Out of the variety of categories entrants can select, I chose "Green." There's no big reward involved for the winner, aside from a shout-out in the magazine and a trip to the awards ceremony in NYC. This blog (and my books) is simply my labor of love, and I really, truly love what I do, so I figured, if you love something, why not share the love, compounding it in the process? Also, I'm totally digging Country Living's content and style recently. It highlights the best of what's considered "country" today without the customary preciousness or cuteness, which I vibe with. Anyone else out there feeling me? I'm not going to beg, or plead, or grovel for your vote. I'll simply leave it at, I've entered, and, if you like what I do around here, and you feel so inclined, you can nominate me here. Have a lovely weekend, everyone. I know that most of you are sweating like beasts under a sweltering sun (except for you, Pacific northwest, which I'm currently eyeing with a very, very green eye!). Do whatever you've got to do to keep cool, please. We don't have a.c. in our house, aside from a window unit in the bedroom (because hot babies do not make for sleeping babies! ), so I know firsthand just how rough it is. Stay hydrated, find a creek or lake or river or pond or ocean or kiddie pool (our route!) and get your chill on, eat ice cream, make gazpacho (or the Cucumber, Dill & Yogurt Soup in my Home Dairy book!) and take it nice and slow and easy!!! They love me in Jamestown! The first permanent English Colony, founded in Virginia in 1607, has my entire series available for purchase in their gift shop. Thank you SO MUCH to Doug, aka the "Haphazard Countryman" (the voice behind Concrete to Chickens) for snapping this photo and sending it to me. I spent 8 very formative years in Virginia Beach and Chesapeake, Virginia, traveling often with family and schools to Jamestown, Yorktown, and Williamsburg to visit the historical sites. The fact that my series is now being carried in and supported by somewhere that is so tied to my childhood means more than words can express. I got my first taste of canning as a wee lass, watching my grandmother "Nanny" (a sassy thing, turning a young 86 in August!) transform her garden cukes into bread & butter pickles and her grapes into violet-tinged juice. If canning wasn't part of your family's culinary background, however, and the recent resurgence of interest in this means of preservation has got you intrigued, I've got just the thing for you. The fine folks at Jardin (the maker of Ball canning products) sent me a complimentary assortment of their wares, including all of those pictured above. In case you can't make them all out, there's: an impressive jar lifter; a 'nifty' (one of my Pop's favorite words!) canning funnel; a great book of recipes from Ball; sample packets of pectin and salsa seasoning; and a "Home Canning Discovery Kit", which includes a plastic basket used for lifting jars safely in and out of the boiling water bath and 3 pint jars with lids and screw bands. These items will help transform all of you canning dreamers out there into doers. And I'm giving it all away to one lucky small measure reader. Even if you're already deft with a water bath and can wield a jar lifter with the ease that comes from experience, feel free to enter the giveaway. These items will equally inspire, and assist, newbies and old-schoolers alike. To enter the giveaway, simple leave a comment below describing what tempts you about canning. If you're already canning, what brings you back? If it's something you've longed to do, why? I'll go first. For me, it's time in a bottle. When cherries are on sale here, or I pick a mess of blueberries from wild bushes up on the Blue Ridge Parkway, or a bumper crop of cucumbers show up at the farmer's market (or, even better, in my garden), I know just what to do with them. Freezing isn't much of an option for me. Not only do some things not freeze well, but, having been privy to one too many extended periods without electricity out here, and not owning a generator, a freezer just wouldn't cut the mustard for my preservation needs (when pine trees fall on power lines during snow storms and you live one mile down a snow-covered dirt road, the utility companies out here, I've learned, sort of think you're the type of person who can handle power outages longer than the "city folk" can). Canning these items, though, holds them in suspended animation, keeps 'em fresh and delicious, and ensures I can enjoy pickled cherries when the snow falls, or slather blueberry jam on my Christmas morning toast. That's why I answer the siren song. Et tu? What beckons you? Please be sure to leave a means of reaching you, either by listing your e-mail address or website/blog, in your comment (if your profile link contains that info, that'll do). I'm open to international commenters if you're open to considering splitting the shipping costs. The giveaway will run through next Friday, July 29th, at midnight EST. Check out this fantastic profile of Claudia Lucero on Etsy's blog. 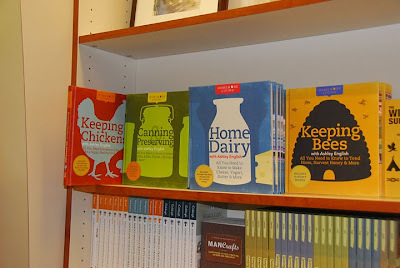 She's the force behind Urban Cheesecraft and is one of the lovely dairy-makers profiled in my Home Dairy book. P.S. When not transforming milk into cheese, Claudia works at a rock 'n roll camp for young girls. Is she not quite possibly the coolest person you've ever heard of??? I have LONG pined for a sturdy, well-crafted crock in which to ferment and culture all manner of things. My sweet Hubs knew this, and so, along with a gorgeous necklace (laser-cut by an Australian designer out of recycled steel!!!) and earrings from one of my favorite local jewelry designers, he picked me up the stunning crock you see before you as a birthday gift last week. I can't wait to make kraut, kimchee, homemade fruit brandy and so much more. What about you? What do you like to like to let sit and stew in its own juices? On the radio, that is. I'll be chatting on Martha Stewart's Sirius XM program "Everyday Food" this coming Wednesday, July 20th, at 12:15 p.m. Sandy and I will be talking about all things "yogurt." *Even if you don't have a subscription to Sirius, you can listen to the show via a trial subscription. For details, go here. Alright, friends. Let's do it. Let's put lids on things, together! I'll be hosting the first ever canning class, chez English, on August 13th. In recognition of national Can It Forward Day (cosponsored by the fine folks at Canning Across America and Jarden), we'll fire up the water bath, talk about botulism (and how to avoid getting it), get sweaty, and make some a fine batch of preserves. The class will run from 11-2. We'll break for lunch while our jars cool, drink lemonade, eat a homemade meal, and chat about all things canned, or whatever you'd like to discuss, dissect, divulge, etc. The class cost is $30, which includes instruction, printed materials, and a jar of preserves for you to take home, as well as lunch. Because my kitchen isn't stadium-sized, I'll have to cap the number of attendees at 10. If you're interested, please leave a comment with your contact information and I'll be in touch. In your reply, please let me know if you're a vegetarian or if a meat option works, as well as any other dietary sensitivities you might have. Please be advised that we live in a home with both cats and dogs, so if you have allergies to pet dander, you might want to take that into consideration (although we keep brand name antihistamines on hand, because we do try to be good hosts ;^) ). Lastly, the jury is still out on whether I'll be making us pickles or jam. If you've a preference, please indicate accordingly in your reply. I hope to see some of you out here! Oh, and know that classes for home dairy-making, backyard chicken-keeping, and beginning bread-making are all in the works. As my home is not an air-conditioned one, though, I figured we'd wait to do those in September and October. Claire, lucky #2, as chosen by the Random Widget. Thank you so very much to all who entered. I've got plenty more giveaways in store for you. Next week, I'm switching things up a bit and will be giving away some canning supplies! Look for details next Monday. It's been a great year, for so very many reasons. And the cherry on top? This guy. I've got another great post for you. Today you'll be meeting Anna, the blogger behind The Road to the Farm. From her apartment in St. Paul, Minnesota, she and her husband are carving out a handmade, homemade life, and not letting a lack of land stop them. Here Anna shares her thoughts on and solutions for homesteading on a small scale. "Do you dream of having a few acres, growing your own food, keeping chickens, maybe a goat or two? Do you fantasize about walking out your back door and picking buckets of berries or apples or fresh corn? If your backyard is anything like mine, it has a few patches of grass and several cars occupying the parking spaces. As an apartment dweller and renter, I have all of these dreams and not a scrap of land to call my own. Although I hope to have a farm or homestead someday in the not too distant future, I am not letting my circumstances keep me from living the life I want. A farm, or homestead, means different hopes, dreams and ideas for different people. My interest is strongly connected to my love of food (growing, cooking, preserving and eating it) so I focus my landless efforts on this. While I think it is crucially important to work toward your dreams and long-term goals, I believe in the importance of living your dreams now, despite your circumstances, rather than waiting until everything works out perfectly to make them happen. Here are some of my ideas for bringing your farm to you, no matter where you are. Growing – You don’t need land of your own to start growing your food. You could start as small as a jar of sprouts on your kitchen counter. 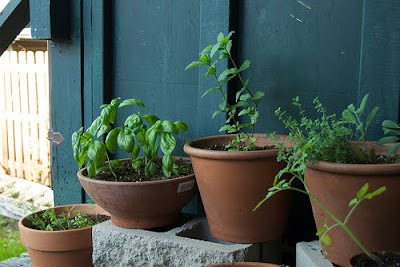 I have a shady area outside my back door and have filled it with containers of herbs, flowers, greens and a few vegetable plants. They could use a little more sun, but having plants right outside my kitchen brings me immense joy. 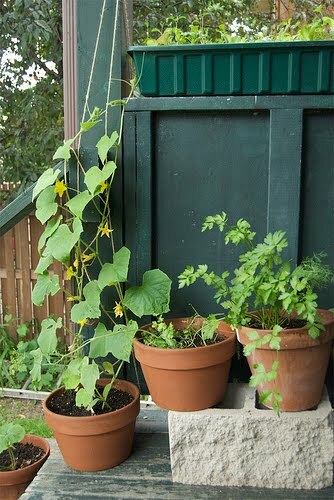 I urge you to embrace your green thumb wherever you are and plant some seeds or seedlings. Many towns have community gardens where you can rent a plot of land to grow on. If you are new to gardening this is a great way to learn from other growers and start on a small scale. Community Supported Agriculture (CSA) is a system where farms sell shares of produce to customers. Often, CSA farms also offer works shares. If you are interested in learning about farming on a larger scale, you can learn by working on the farm in return for your share of produce. You can also join by paying up front for a whole season of produce. Frequently, CSAs encourage their members to become involved and get to know each other, which is an opportunity to join a community of others who are interested in local food. Eating – If you don’t have time to grow it yourself, there are still many opportunities to find fresh produce to fill your kitchen. Farmer’s markets have sprung up all over the country. Buying directly from the farmer not only supports local agriculture, it is also a chance to get to know the people who grow your food. If you have questions about growing and eating in your region, your farmer probably has answers. Pick-Your-Own farms are a good way to get lots of fruit (and sometimes vegetables) for freezing and canning. It is part of my summer ritual to pick and freeze strawberries and blueberries so we can eat them in pancakes, muffins, and smoothies for the rest of the year. Throughout the summer, I keep in mind that all of the local abundant food isn’t going to last. If I have something extra, I try to freeze it. When tomatoes are piling up on farms and in markets, I buy an abundance and make salsa and sauce which I can for us to eat all winter. Even though I’m not growing it myself, I am still planning ahead and providing for the winter. Making – I satisfy my need to create, grow, and make it myself by making as much of our food from scratch as I can. I don’t have a cow or a goat, but I can get organic, locally produced milk from my co-op. I make yogurt weekly and make crème fraiche, butter and a soft cheeses whenever I can. My sourdough starter lives on the counter and I tend it with the care I will eventually bestow on a flock of chickens. Weekly bread baking is a ritual that keeps me connected to our food needs. Building, brewing, fermenting, and crafting are among many other ways of cultivating your creative side. 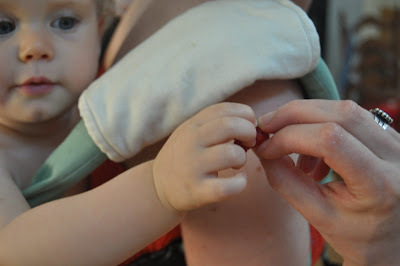 Connecting – Though I hope to one day produce much of my own food, I don’t believe in self-sufficiency. No one can do it all themselves and, if they did, they would miss out on the benefits of what their neighbors can provide. Community thrives in urban and rural areas, in gardens and on sidewalks. Wherever you live, chances are there are other people who are interested in growing, eating, and making from scratch. Some may already have land or practice skills that you want to learn. Connecting with other people who are living handmade lives can be an incredibly rich resource. Here in the Twin Cities, I attend a monthly food swap where I get to meet other people who love homemade, share something from my kitchen, and try what they’ve made. There are meet up groups, skill shares, canning classes, farm tours and neighbors out there ready to teach you more and learn from your experiences. 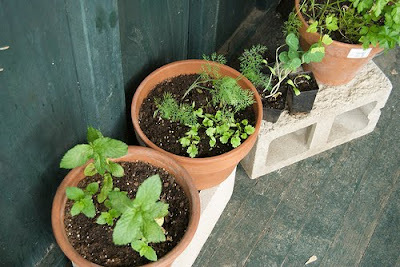 Whether you have a field, a window box, or a worm bin, how are you bringing your homemade and home grown dream to life?" Thank you, Anna, for your inspiring post! If you've got something you think might resonate with small measure readers, hit me up! We'll see if we can't work something out. I'm not certain of the exact time I became acquainted with the Slow Food movement, but as soon as I did, it immediately resonated with me. 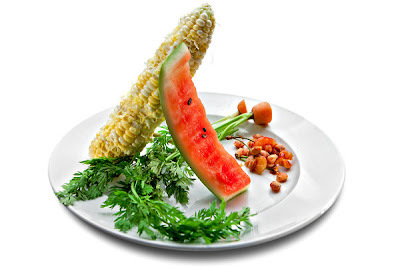 The movement's stated mission of seeking food that is equally "good, clean & fair" cuts to the core of my food interests. Slow Food's claim "we believe that the food we eat should taste good; be produced in a clean way that does not harm the environment, animal welfare, or human health; and that its producers should receive fair remuneration for their work" are words that flow just as freely from my own lips. In the summer of 2008, I traveled alone (someone has to stick around to care for our little homestead, this being before we'd secured a trusty house-sitter!) 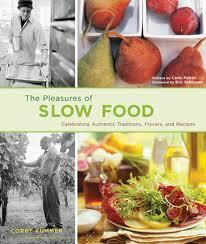 to San Francisco for Slow Food America's "Come to the Table" conference. It proved to be a life-changing, immensely transformative experience, that won't soon be forgotten. We're all about "slow" living, chez English. From drawn-out, rambly meals with friends, to spontaneous pancake breakfasts with my mom (we added fresh blueberries & wineberries from the yard to Hub's "pancakes of perfection" this past Sunday! ), we adore taking time, care, love, attention, precision, and fascination with all things food related. And so, in recognition of my slow food love affair, today I'm offering up The Pleasures of Slow Food, a gorgeous book loaded with recipes that take a bit of time, but are worth every delicious bite. To enter, simply list the food you love to make that takes a bit of extra time, love, and/or elbow grease. I'll offer mine: salted chocolate chip cookies. Not the sort of affair you whip up and consume in 30 minutes, these tasty morsels require the patience of 36 hours before their sweet salty goodness is yours. Do it, though. Bide your time, read a novel (this is my recent fascination), make some lemonade, count fireflies, and then, finally, eat your heart out. The giveaway will run through next Monday, July 11th (which, incidentally, is my 35th birthday! ), midnight EST. PLEASE leave a way for me to contact you, should you be the winner, via either an e-mail address, blog, or website. I'll randomly choose a winner (via the random widget) and post the winnings the next day. I've had inquires about why I only open my contests to U.S. residents. The answer is that I'm just a simple, stay-at-home writer and mom, on a budget like so many others. If international folks would like to try their hand at winning, that's fine by me, just know that I might need you to go in on the postage with me, perhaps via Pay Pal, as one small measure wrote and suggested. *If you'd like to read another "slow"-focused small measure post, check out this little ditty on "slow design" from awhile back. We three Englishes enjoyed an al fresco lunch today. We nibbled on a cobbled together "Ploughman's lunch", featuring local cheese from Spinning Spider, meat from Hickory Nut Gap farm, dill spears, an olive & caper berry medley (thanks, Nicole, for passing these over to us after last week's picnic! ), an aged Cheddar, beet pie with horseradish cream, and fresh iced tea. The wee-est amongst us feasted on N.C.-grown sweet potatoes. Nothing beats eating outside. Its long been my favorite way to dine. When Hubs lived in Vermont long ago, he used to eat outdoors even during the cruelest winter days. Huxley seems to dig it, too. We're off to Charlotte tomorrow to celebrate my nephew Jimmy's first birthday. It'll be a treat having the cousins, only 3 1/2 months apart in age, play together, giggle together, and just be boys together. May you all have a lovely weekend. I'm thinking we'll gather some folks chez English this Monday for the holiday. We picked up a kiddie pool for Huxley, the blueberries & wineberries are in high gear, the breeze is just fine, and we love entertaining. Wherever you are, whatever you do, may it be grand!